Albania is a fascinating and rapidly developing corner of the Balkans. In a country where concrete bunkers scar the countryside, Mercedes race past donkey-drawn carts, social spaces are occupied by men-only, and mountain vistas rival those of the Alps, simple definitions don’t come easily. 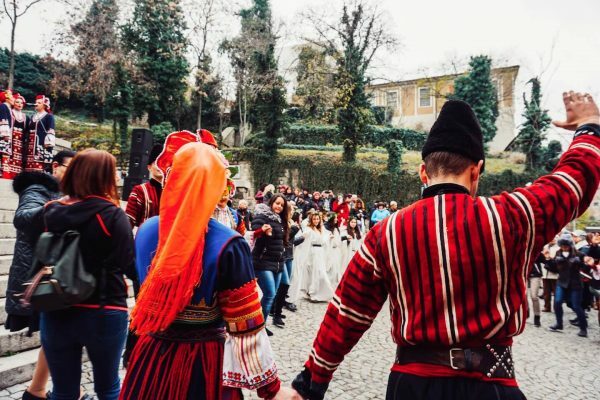 Albania offers you a rare opportunity to travel off the beaten path in Europe and shape your own adventure without the heavy influence of social media. We spent 2 weeks in Albania exploring everything from the mountains and riviera to Ottoman-style towns and castle ruins. 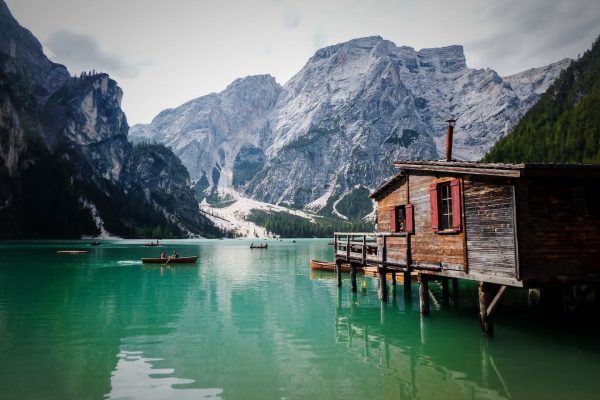 This travel itinerary is a modified version of our own in which we utilized transit (shuttle, bus, ferry) for the first half of our trip, and rented a car for the second half. 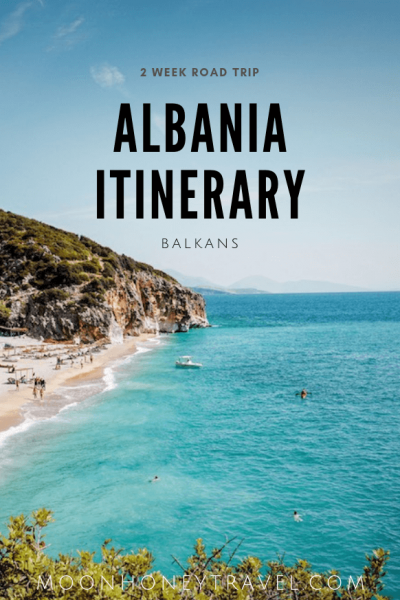 Read this day by day Albania itinerary along with our Albania Travel Guide for practical and candid trip planning advice. We’re going to tell you exactly what to do, and what to skip. 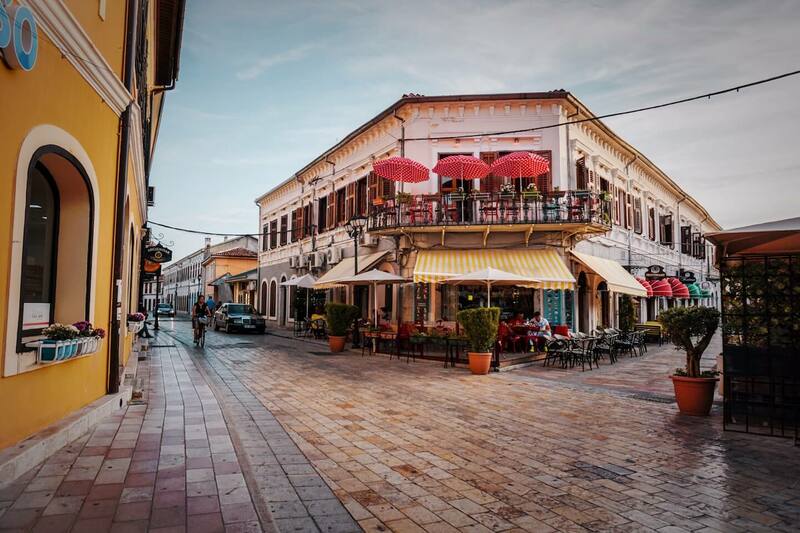 Your Albania Itinerary begins in Shkodra (also spelled Shkodër, or Skadar), a vibrant city in the North that offers visitors an authentic glimpse into Albanian culture. You’ll find a thriving bar café culture here along with a string of tempting bakeries and eateries. For most travelers – ourselves included – Shkodra is a transit stop between Tirana and the Albanian Alps. If you have time, check out the ancient Rozafa Fortress. From Montenegro: There are direct buses from Podgorica, Montenegro, to Shkodër that leave twice a day. Duration: 2 hours. Price: 10 EUR per person. We booked our ride via GetbyBus.com. 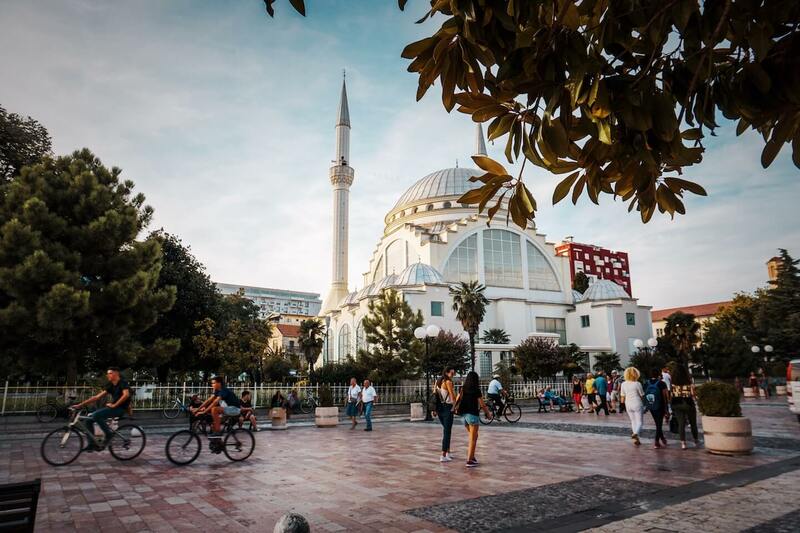 From Tirana: There are direct buses from Tirana to Shkodër that leave throughout the day, roughly between 6:30 a.m. and 5:00 p.m. There’s no need to make a reservation, just head to Rrethrrotullimi i Doganës and hop on the next Shkodra-bound bus. Check out Gjirafa.com for timetable. Price: 300 Lek per person, which you’ll pay on the bus. Our Way Hostel – We chose Our Way Hostel because this hostel organizes transit to Theth (10 EUR per person) and provides free luggage storage. Another bonus is that Our Way Hostel is only a 15-minute walk from the bus station. Our only complaint about staying here is the noise. Rate: 7.50 USD per person. 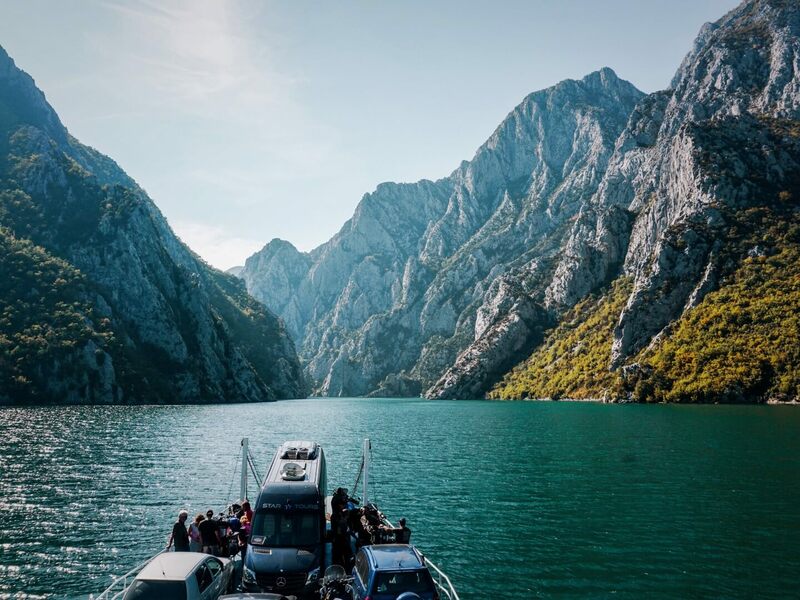 On Day 2, you’ll take a shuttle (furgon) to Theth and embark on your Albanian Alps adventure. In a few days, you’ll return to Shkodra, so it’s best to leave most of your luggage and belongings at your hotel. Only bring what you can hike with. Our shuttle-ride to Theth (10 EUR per person) was organized by One Way Hostel and departed at 8:00 a.m. It took 4.5 hours to reach the village. If you’ve traveled in Nepal, you’ll have serious déjà vu. If you haven’t, prepare yourself for one hell of a ride. There’s plenty of time today to explore Theth. When we arrived, we opted for a slow lunch and a nap, before taking a relaxing walk through the village. If you’re feeling energetic, you could hike to the Blue Eye today. It’s possible to shorten the hike by getting a ride to the end of the road. Please research the going rate, or else you’ll be overcharged. Gjin Thana. This charming stone guesthouse weaves its own special magic. Positioned above the village center, Gjin Thana offers guests a tranquil place to relax, eat slowly, and converse with fellow travelers. All food is homegrown, plentiful and delicious. Because the guesthouse only accommodates a few travelers, we highly recommend making a reservation. Most travelers depart Theth today. 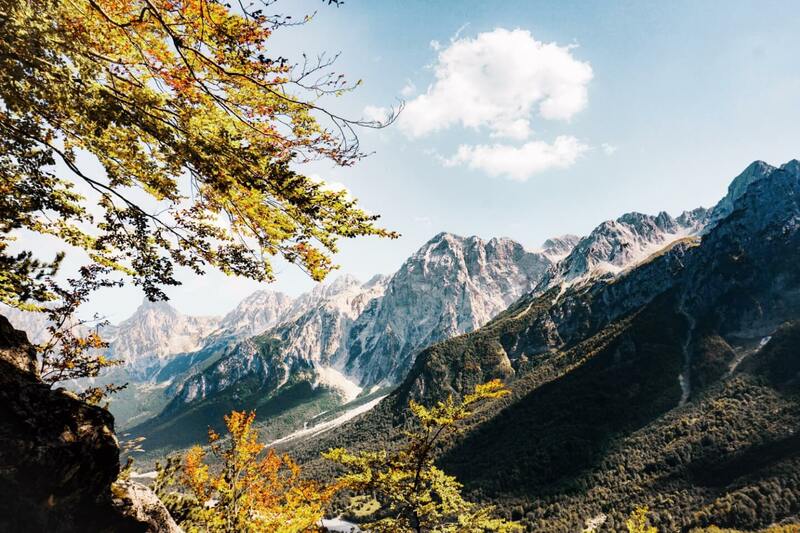 We highly recommend building an extra day into your itinerary to relax and enjoy the beauty of Theth valley, before embarking on the hike to Valbona. 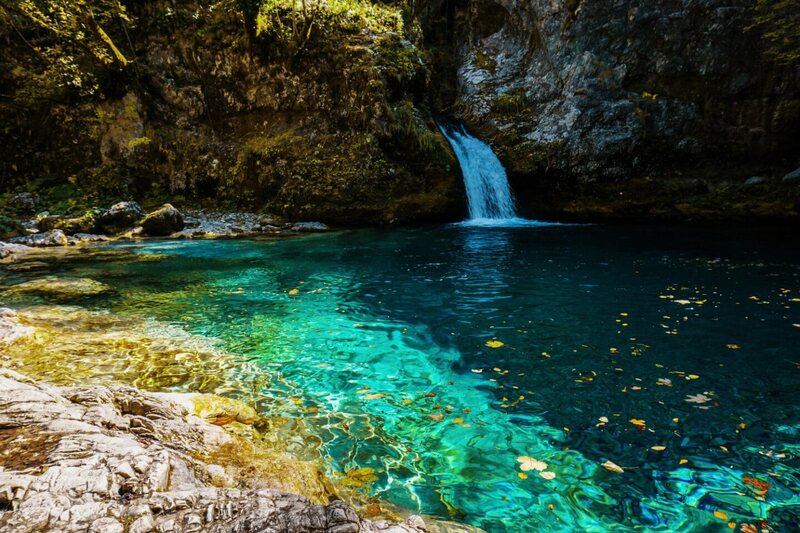 With your extra day, you can hike to the Blue Eye pool or Peje mountain pass in the Albanian Alps. Blue Eye (Syri Kalter). There are a few ways to get to the Blue Eye. From the Tourist Office, you can cross the nearby bridge, turn left, and follow the road all the way up (less scenic). Alternatively, you can take the footpath on the left-side of the river. The footpath is a nicer trail but poorly signed. Download Maps.me for trail guidance. If you want to shave off the first two hours of the trail, you can hire a driver to the end of the road. From there, it’s a 45-min hike to the spring. Qafa e Pejës (6-7 + hours return). To find the trailhead, follow the gravel road in the direction of the Valbona Pass trail (opposite direction of the Blue Eye). You’ll reach an intersection with signage indicating right for Valbona Pass and straight for Peje. The first two hours of the trail are flat, followed by a 90-minute ascent. The hike offers up beautiful views of the valley, but the real reward is the view from the pass. You’ll want to keep hiking in the direction of Montenegro because the vistas get better and better. Note: this is part of the Peaks of the Balkans trek. To return to Theth, follow the trail you came up. Gjin Thana – One of the highlights of staying in this guesthouse was dining outside under a canopy of vines each morning and evening. Each meal was a surprise, as there’s no menu to order from. The family prepares something unique each night and serves you a feast of fresh vegetables, meat, salad, and dips. Don’t miss out on their homemade red wine. The Valbona Pass hike is the reason many travelers venture to the Albanian Alps. The 6.5 – 7-hour trail can be hiked in either direction, and it’s equally beautiful either way. However, Valbona (also spelled Valbone) valley is more dramatic than Theth valley. If you want to crescendo your way into the Accursed Mountains, hike Theth to Valbona. That being said, it might be logically easier to organize the trip Shkodër – Valbona – Theth – Shkodër. 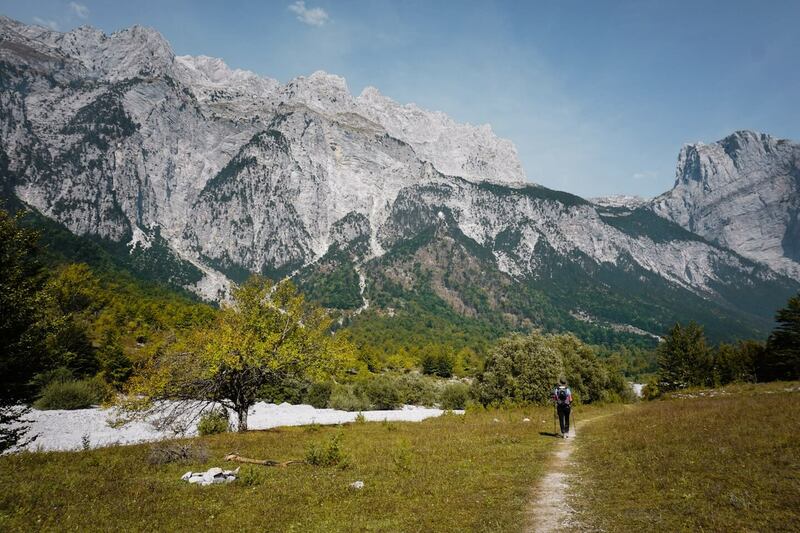 If you’re a well-seasoned hiker, reaching Valbona Pass isn’t difficult. It’s a 3-hour ascent to the pass. You’ll find a water-source 2 hours into the hike. There are plenty of places to rest at the top and enjoy the panoramic valley and mountain views. Bring snacks! From the pass, it took us another 3 hours (with breaks) to reach the paved road in Valbona Valley. When you reach the road, you think you’re done with the hike. You’re not. 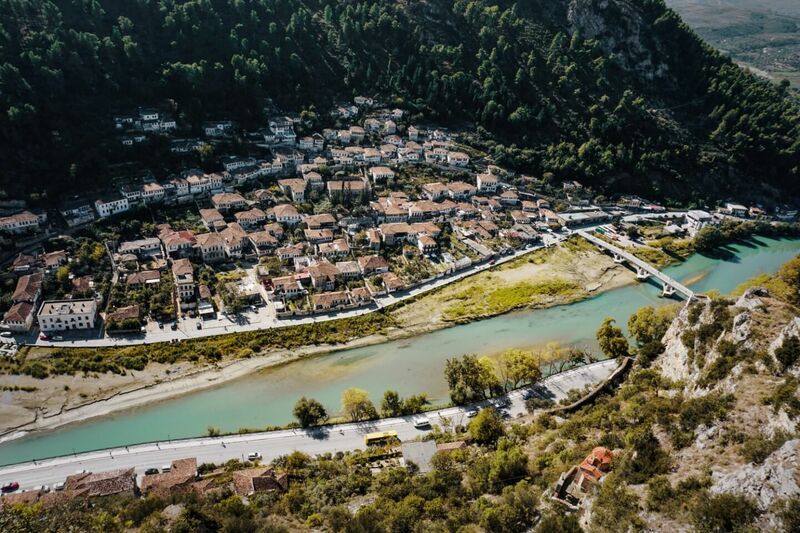 It takes another 30 minutes to get into the heart of Valbona, which is more of a spread-out region than a concentrated village. 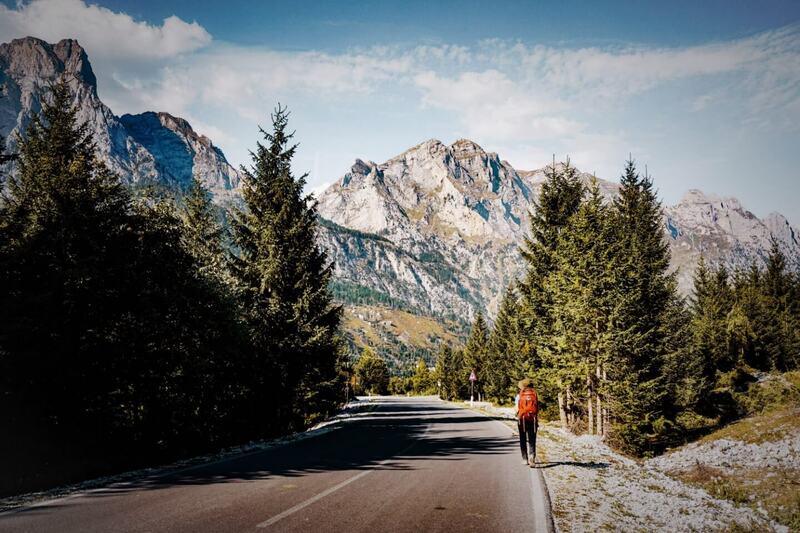 We highly recommend securing your accommodation before reaching Valbona and organizing a pick-up from the end of the trail (beginning of the paved road). To reach some guesthouses, it may take an additional 1.5 hours. If that’s not your style, no worries. Walking the paved road does have its benefits: epic mountain views. We stayed in Guesthouse Kukaj. Allegedly the guesthouse offers a free pick-up, however, we didn’t know that. To reach Kukaj on foot, it’s another 2 km (45-60 minutes) uphill from the Valbona Tourist Office. Pros of staying here: it’s remote, surrounded by mountains, located on a hiking trail, and delivers an authentic experience. Cons of staying here: it’s far away from the road, it’s overpriced (unless you’re camping), and the guesthouse owners aren’t very helpful. Valbona Valley is epic. Mountains tower above you in every direction. Most travelers head back to Shkodra today, but if you appreciate slow travel, stay an extra day. There are many hiking options in Valbona. However, it may be difficult to understand what those options are. Trail signage is minimal and tourist maps and brochures are nonexistent. We recommend doing some preliminary research before the trip. There is a Tourist Office in Valbona, but it was unfortunately closed during our visit. Hike to Kukaj – Even if you don’t stay at Guesthouse Kukaj, you could venture up there for the views. Guesthouse Kukaj – Read our honest review on Day 4. Day 6 is a long one, but tremendously rewarding. The highlight is the 2.5 – 3-hour ferry ride that traverses Komani Lake (Lake Koman). The best way to organize your transit is directly through Berisha small car Ferry (if you’re traveling between April and October). The whole transit package, including a shuttle (furgon), a ferry and a bus, is 15 EUR per person. 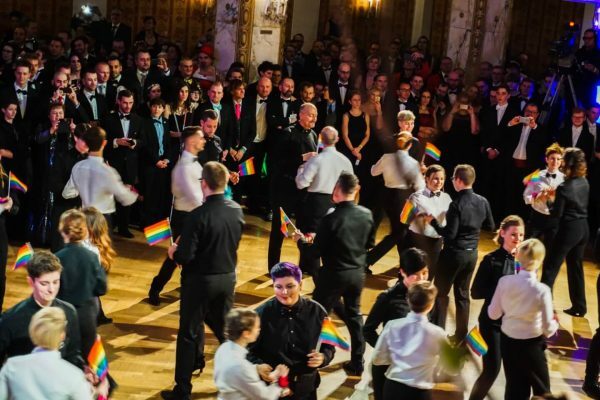 You can make a reservation online, or call this number +355 (0)69 68 00 748. Some guesthouse owners may do this for you (but don’t count on it). Here are your other transit options. At about 10:00 a.m., you’ll get a shuttle (furgon) pick-up from your guesthouse. The drive to Fierze ferry terminal takes 1 hr and 15 min. We arrived 2 hrs before the ferry departure, so we chatted with some travelers over coffee and secured the best seats on the ferry. There’s one café at the Fierze terminal. The Berisha small car ferry departs at 1:00 p.m. sharp. It took 2.5 hours to reach Koman. From there, we showed our ticket stub and were guided to a Shkodra-bound bus. The final bus ride took 2 hours, and we arrived in Shkodra at 5:30 p.m. This multi-leg journey might sound confusing, but we assure you that it’s very straightforward and easy. Komani Lake is a very narrow reservoir framed by vertical mountain slopes. It was created in 1978 when the Drin River was dammed. The Komani Lake Ferry is actually a commuter ferry connecting the towns of Fierze and Koman. However, in the last few years, it has developed into a popular tourist attraction. Our Way Hostel – We returned here for one night, before continuing our journey. Our luggage was securely stowed away until our return. 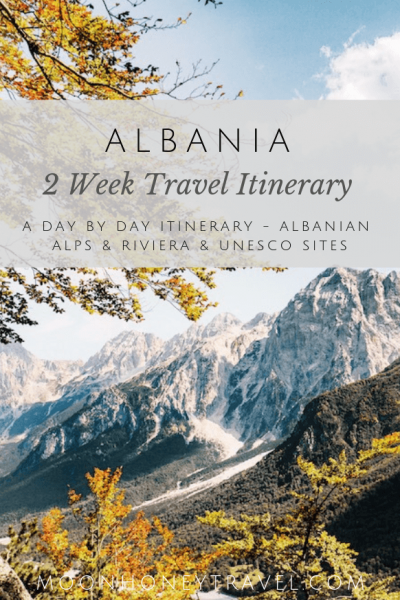 Day 7 of your Albania Itinerary is another multi-leg journey. First, head to Tirana. Second, pick up your rental car and head directly to the Ionian coast. 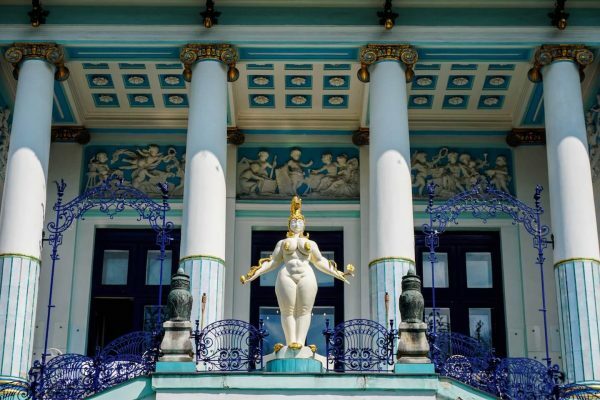 Don’t worry about missing out on Tirana; you’ll end your road trip in the capital city. Buses to Tirana leave hourly on the hour. It takes about 90 minutes to reach the capital and costs 300 LEK per person. You’ll pay on the bus. Use Maps.me to find the exact location of where the Tirana-bound bus departs. We rented a car from Europcar. The process was seamless. We had a problem with our trunk later in the day (it no longer opened), and Europcar came to our accommodation in Vlorë the next morning and switched the car for us. Vlorë is the third most populous city in Albania. It reminded us of a big beach town in Southern California. The whole coastal area is highly developed with a string of sea-facing restaurants and monstrous high-rises. Vlorë beach was completely deserted in late September. Usually, that’s a good thing, but it felt too empty. At night, however, Vlorë springs to life. What felt like a depressing and tasteless resort town during the day becomes a vibrant and bustling town after sunset. We stayed one night in Vila Rias. Our room was lovely, comfortable and clean. It’s a five-minute drive from the main Vlorë drag and beach, so we only recommend staying here, if you have a car. Today’s drive through Llogara National Park and along the Albanian Riviera will spoil you with impressive coastal views. You’ll drive through the Ceraunian Mountains along the serpentine Llogara Pass Road that reaches a height of 1,027 meters. There are a few cafés and restaurants at Llogara Pass that offer a pleasant place to rest and enjoy the view. As you descend from the pass, the shimmering Ionian Sea stretches out to the horizon. 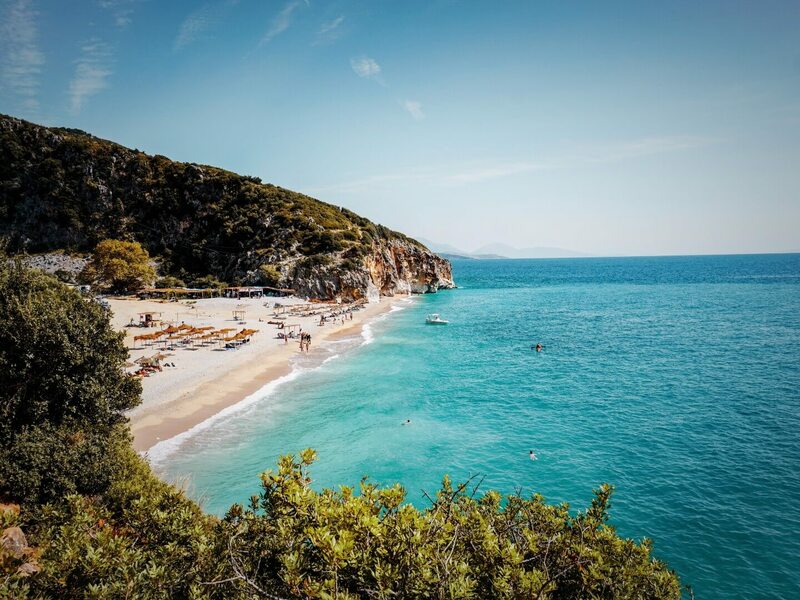 The Albanian Riviera is becoming more and more attractive to beach travelers, because it’s less saturated and more economical than neighboring countries. Albania’s coast is developing and there are many beaches to choose from. As you travel south today towards Himara, we recommend carving out a few hours to enjoy Gjipe Beach. Dhermi (also spelled Dhërmi) is a small coastal village, just south of Drymades. We suggest stopping here for lunch, or to dip your toes in the water. If you’re debating whether to base yourself in Dhermi, or Himara, we highly recommend Himara. Dhermi is lovely, but it’s small. Squeezed between cliffs, this beautiful beach is an oasis that promises solitude and relaxation. You can only reach Gjipe by boat, or by foot, which means that only the motivated venture here. As you continue the drive south along the coastal highway SH8, look for a road on your right signed Manastiri i Shën Theodhorit (St Theodor’s Monastery). Follow this narrow road until you see a tiny parking lot on the left. There will be a sign indicating “Gjipe.” This is where the trail to the beach begins. There may be a parking fee of 200 Lek, but when we visited in September, no one was there to collect. From the parking lot, it’s a 25-35 minute scenic hike down to the beach. At the beach, you can rent a set of chairs and umbrellas for 500 Lek. Before heading to your guesthouse or hotel in Himara, make one final stop: Himara’s Old Town. Crowning a hilltop high above the coast, the Himara Castle looks more like a pile of crumbling rocks than a castle, but it offers a beautiful view of the coast. After exploring the ruins, check out the post-byzantine church of Sergji and Baku. You might expect this historical place, which traces its existence back to the Bronze Age, to be lifeless and altogether removed from modern life. But, it’s still inhabited. 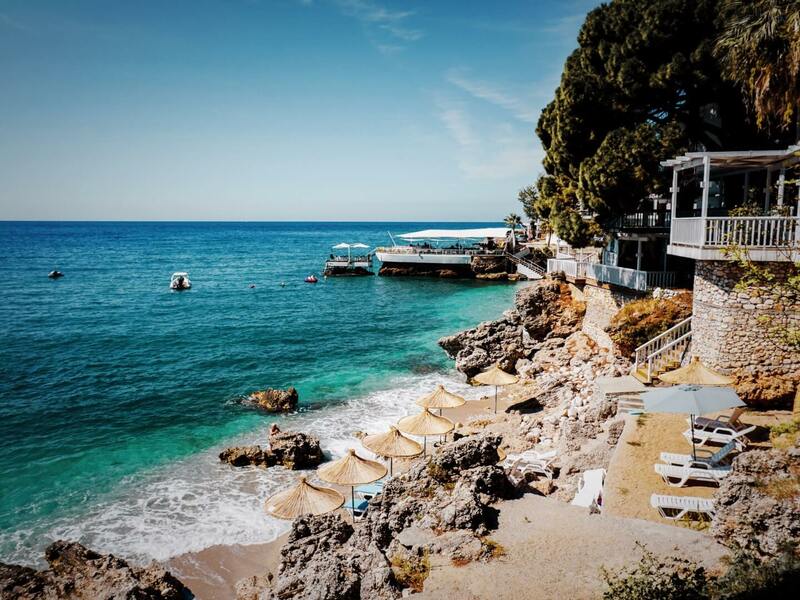 We recommend staying two nights in Himara (also spelled Himare), so that you can fully relax into your trip and enjoy Albania’s most charming beach town. We stayed at Calliope Apartments, which is walking distance from Livadhi Beach and a quick drive to the town center of Himara. Though communication was limited, our hosts were very kind and welcoming. Our room was beautiful and equipped with a small kitchenette. Bonus: free laundry service. The drive to Gjirokastra continues south along the coast to Saranda, before heading inland and northeast. Notable beaches between Himara and Saranda include: Llamani, Porto Palermo, Borsh, and Bunec. Our favorite was Llamani, a pebbly beach set in a scenic cove. As your journey continues, make a stop at the fortress Porto Palermo, also known as the Castle of Ali Pasha. You’ll navigate through dark corridors and eerie staircases before reaching the top of the ruins. There’s some debate about the age of the fort. Some sources say the 19th century, while others claim the 17th century. In more recent history, the fort served as former Soviet submarine base during the communist era. You’ll drive through Saranda on your way to Gjirokastra. Our original plan was to stay the night in Saranda, but after lunch and a walk through the town, we decided to leave. Saranda is over-developed and charmless. We changed our plans and continued the drive to Gjirokastra. Remember the Blue Eye of Theth? There’s another Blue Eye in Albania and it’s near Saranda. A few years ago, this may have been a peaceful destination. Now, it feels like a ridiculous tourist trap. Don’t waste your time. 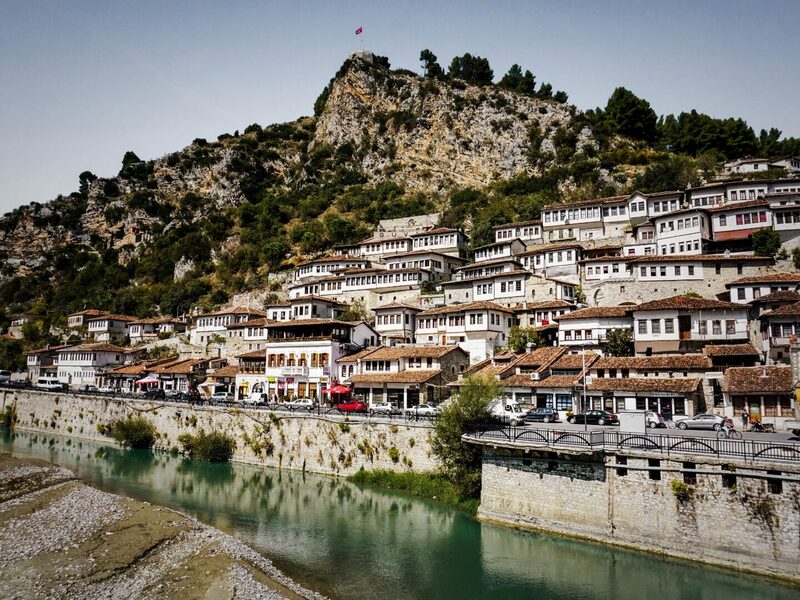 The old town of Gjirokastra (Gjirokastër) is a UNESCO World Heritage Site. Upon arriving, you’ll be struck by the Ottoman style architecture, enchanting cobblestone streets and the castle overlooking the town. Settled for over 2,500 years, this historical destination is one of the best places in Albania to learn more about the country’s history. Start by visiting the Gjirokastra Fortress. Inside the fortress, there’s an excellent museum that provides a sweeping historical overview of the Drino valley and the city. There’s also a museum dedicated to armory, which you can skip. The entrance fee for the castle is 200 Lek. Once you’re in the castle, you’ll have to pay an additional 200 lek for the museum. From the castle, there are excellent views of the stacked fortified houses of the old town, the valley and the mountains. Stone City Hostel – Perfect doesn’t begin to describe this hostel, located in the old town of Gjirokastra. Impeccably designed and professionally managed, Stone City Hostel gets our vote of #1 place to stay in Gjiorkastra. The owners are welcoming, personable and extremely helpful. Breakfast is included. Dorm Rate: 12 EUR per person. The drive to Berat takes 3 hours. Opt for the road via Fier, as opposed to the seemingly more direct route along SH74. We were informed that the SH74 isn’t in good condition. If you’re looking for a place to stop on the way, check out the ruins of Apollonia near Fier. Apollonia was an ancient Greek city founded in 588 BC on a site initially occupied by the Illyrians. The archeological site is accessible all year-round. Entrance Fee: 300 Lek. Antigoni – After a few mediocre meals, Antiogni restored our faith in Albanian food. This lovely restaurant is situated in the Gorica neighborhood and boasts the best view of Mangalem. Hotel Klea – Tucked away near the castle ruins, this hotel’s kitchen serves simple, but very good Albanian food. We stayed at Hotel Berati. It’s simple and affordable. 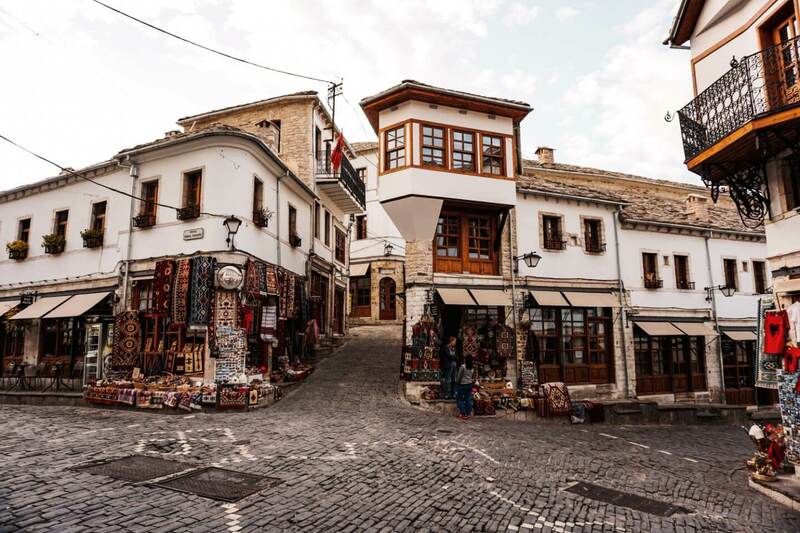 It didn’t blow us away, but the location was perfect for exploring the historical center of Berat. 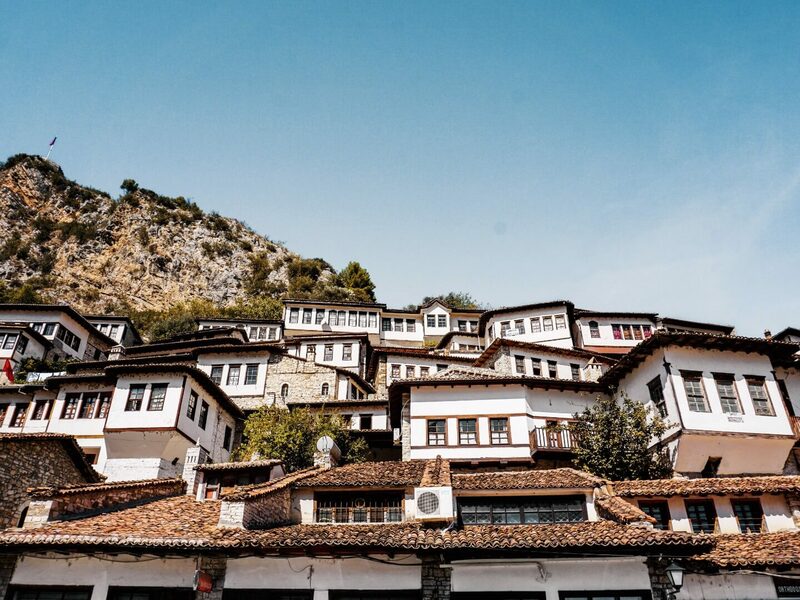 Don’t leave Berat without climbing up the castle ruins for one of the best views of the town and region. After a slow morning in the town of a thousand windows, continue the drive north. 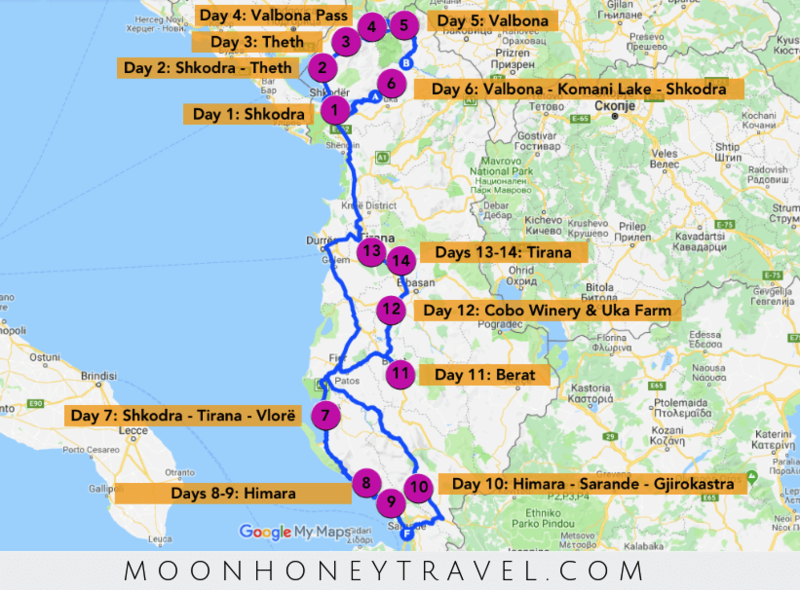 Day 12 of your Albania Itinerary is all about savoring Albania’s finest wines and farm-to-table cuisine. On your way to Tirana, we recommend making a leisurely stop at Çobo Winery. 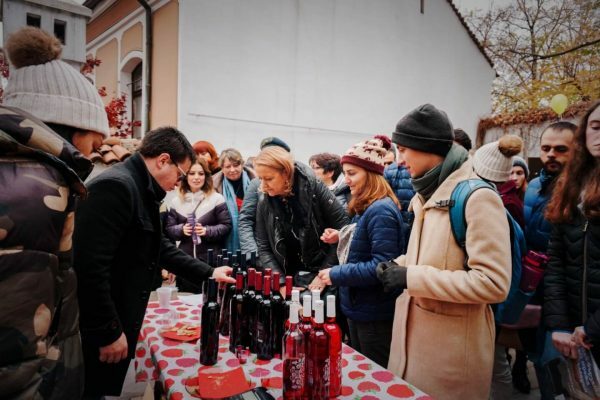 Wine tastings are accompanied by bread, homemade olives, and several cheeses. In so many places, wine tastings are rushed. Not here. Seated under an olive tree, you’re invited to slowly sip Shesh i Bardhë, E bardha e Beratit (puls grape), Shesh i zi, Kashmer (blend), and a special Reserve (2012) that will intoxicate your soul. We dropped by without a reservation and were accommodated very easily. Tastings start at 14 EUR. This biodynamic vineyard and organic farm is located near the Tirana airport. The farm’s rustic dining space almost spills into groves of pomegranate trees and vines. The no-frills cuisine pays homage to traditional Albanian food. If you’re a lover of wine, make sure to try their ceruja white wine (2012). The ceruja grape is a wild grape that grows in Northern Albania. The vines are 60-100 years old and grow freely without any treatment or human intervention. Uka Farm is the the only place in the world where you can drink ceruja. If you like reds, their Chimaera (2016), a merlot, cabernet and kallmet blend, is also delectable. La Bohème Hotel – Great value hotel located in Tirana’s most vibrant neighborhood, Blloku. Hotel guests have access to a spa and fitness center. Garden B&B – This top-rated Bed & Breakfast is located in central Tirana. If you love gardens, breakfast feasts and friendly staff, stay here. AirBnB – There are many budget-friendly apartments and rooms to choose from in Tirana. If you’re new to the platform, sign up here to get a discount on your first booking. 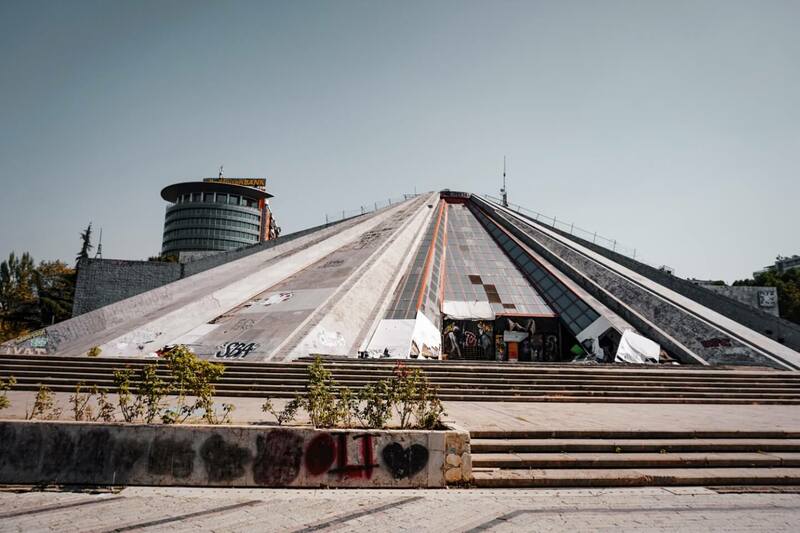 Tirana, Albania’s funky capital city, is a great place to unwind from your road trip. It’s also the perfect place to put everything you saw and experienced into context. 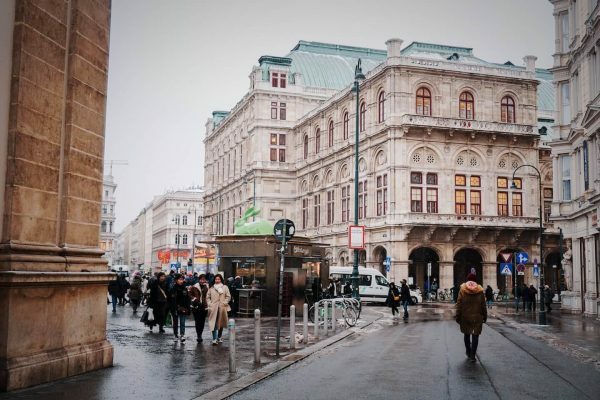 We recommend starting your day with a Free City Walking Tour. Your guide will cover all the important sites and offer personal insight about the country’s darkest era. Next, you can check out the museums BUNK’ART 1 and BUNK’ART 2. Here, you can learn about how the communist government controlled the Albanian population through surveillance and violence inside real concrete bunkers. Our final recommendation is Mullixhiu, a restaurant that is evolving Albania’s culinary tradition one dish at a time. Upon entering the restaurant, you’ll feel transported to a realm that honors the dining experience as much as the food itself. Mullixhiu offers an a la carté menu for lunch and a set menu for dinner. Reservation needed. Address: Shëtitorja Lasgush Poradeci, Hyrja e Parkut tek Diga e Liqenit Artificial, Tirana 1019, Arnavutluk.